We met Edward for lunch in London yesterday and walked along the Thames from Tower Bridge to Tate Modern. 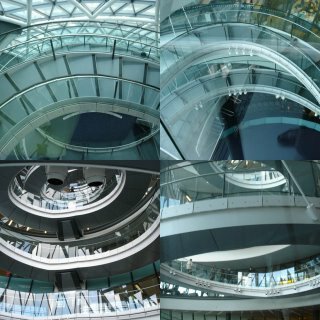 Made an impromptu stop at City Hall, the new glass structure housing the Greater London Authority - that's Ken Livingstone and his support network. As we walked along the river in beautiful spring sunshine, we spotted people at the top of the building, so ventured inside and really enjoyed the views, both inside and out. Above is a collage of my own photographs, but you can enjoy the official views here. I feel a piece of textile work coming on! 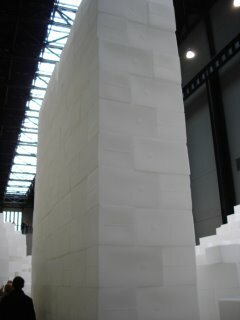 Tate Modern was our goal, particularly the Rachel Whiteread exhibition in the Turbine Hall. We'd heard her on Desert Island Discs last Friday which made it all the more interesting. 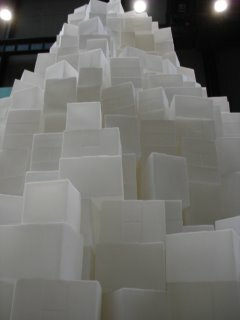 Anyway, we all loved her work and found the "Embankment" exhibit as enriching as the Tate hoped it would be. Above, you can see Mark's favourite stack. Below, you can see mine!